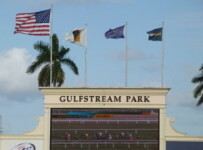 Gulfstream Park will continue its holiday weekend racing on Sunday and Monday, with eleven races and first post of 1:15 p.m. each day. Sunday will begin with an overnight carryover of $2,967 on the Super Hi-5 in the first race. 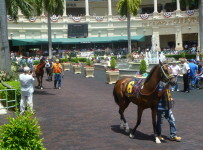 The carryover on the Rainbow 6 is $426,956—the highest yet of the Gulfstream spring meet. It is on races six to eleven. Sunday’s feature is the Opening Lead, a $50,000 overnight handicap at six furlongs on dirt for 3-year-olds and up. 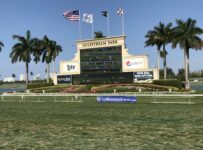 It is the third race with scheduled post of 2:21 p.m.
We will have a preview early Sunday afternoon on our blog, which can be accessed on the menu bar at the top of the home page on this Web site.